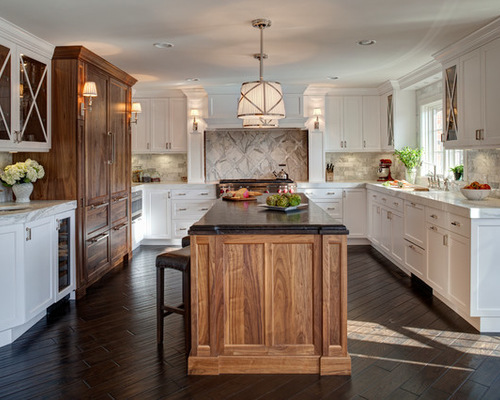 Mixing different wood tones is sometimes hard to do, but I’ve come across it many times when helping clients pick out new hardwood flooring for their home or wood furniture to go with their existing hardwood flooring. There isn’t a magic formula, but as with everything when it comes to decorating…balance is key. When adding new wood into a space with existing wood furniture or flooring, it’s best to try not to match exactly. Wood is so unique that even if you’re matching one oak bench with oak flooring, it’s never going to look exactly the same. It also looks really strange if there is no contrast. Either go with a darker stain on the same wood, go with a completely different wood, or different stain, different wood. You get the picture…mix it up! Here are a few examples of rooms with well balanced wood tones. Break things up with an area rug. If you have a wood dining table on hardwood floors, add a contrasting area rug to break up all of the wood. Add other elements to the room. Metals, glass, fabrics….anything that would contrast with the wood will keep the room from looking too much like a forest. Balance painted wood and natural wood. Too much of each can seem too matchy. 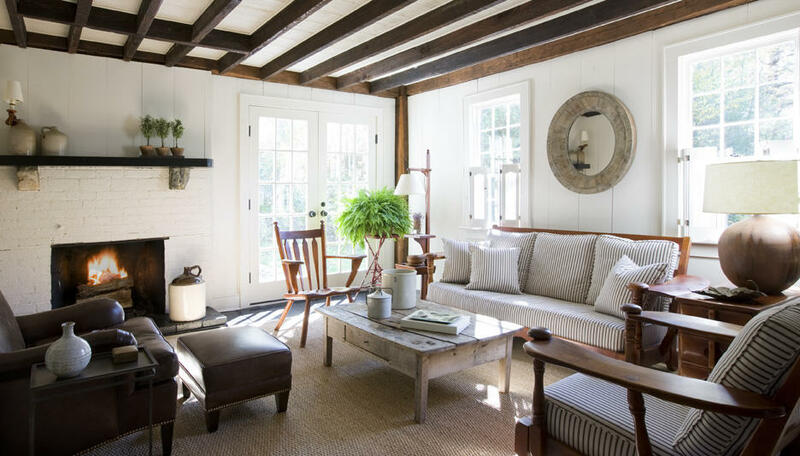 Be strategic when placing wood items in a room. For example, if you have a wood mirror that looks similar to a wood coffee table, try to put them on different sides of the room or separate them as much as possible. With dark woods, especially, add in light colors throughout the room. An all dark room can feel very heavy without a lighter contrast. Is it too early to say I’m ready for fall? I could live in a constant 75 degrees, and it’s been sweltering here in Virginia. Like sweating just walking to the car…THAT hot. I think I just like change, which is why I look forward to new seasons. I also try to do small updates in my home whenever there’s a change of season. Here are a few quick ideas if your decor is lacking color and you’re up for a little update as well. 1. Accents, accents, accents. Jazz up a neutral space with colorful accents such as vases, paintings, or other colorful decorative accents. It’s an quick update and they’re easy to change out if you want to put together a new color scheme. 2. Fabrics. Add colorful fabrics to your room with pillows, curtains or blankets. Here are some of my favorites. 3. Let nature do the work. Bring in greenery or fresh flowers to add an easy punch of color to your space. 4. Area Rugs. Define a space and add color at the same time. Area rugs are easy to switch out if they get dirty, outdated or you want to change your scheme. Here are a few of go to rug sources. Also, read about layering area rugs here. 5. Mirror mirror on the wall. You’ve heard of mirrors making rooms look larger, but they also reflect OTHER colors in the room which gives the illusion of even more color! 6. Shelving. Have a regular old bookcase? 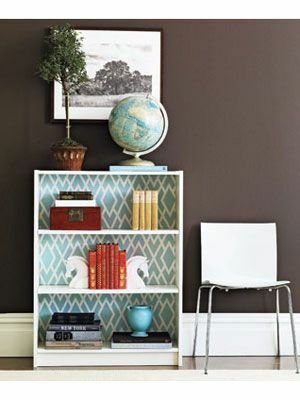 Paint or wallpaper the back of the bookcase to add interest! 7. Show off your dishes. Bring your colorful dishes out to display through glass cabinets or shelving. 8. Determine your color scheme in advance. Decide which colors you’d like to bring into the space. Pick out paint swatches, flooring, fabrics, and furniture prior to purchasing. Combine pictures and samples together to see how it will look before bringing it into the space. 9. Wallpaper. The old school wallpaper has a bad reputation but the newer kinds allow for a much easier removal, so it’s not a forever commitment. It’s a great way to bring in patterns and interest to a room. 10. Tile accents. 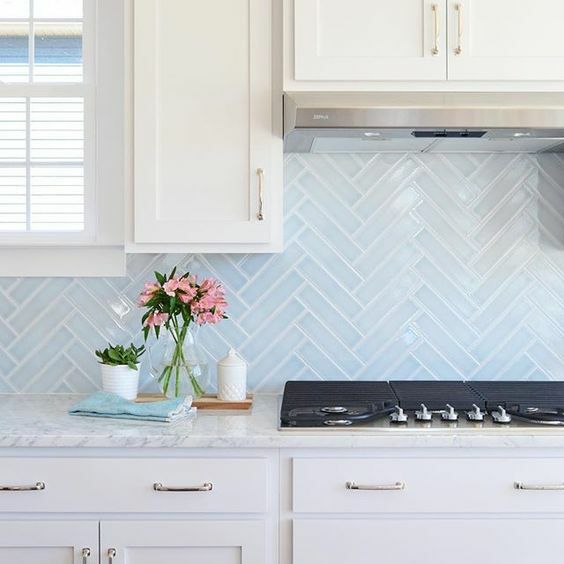 Add tile accents to wainscoting or shower in the bathroom or update a back splash with colorful mosaics. 11. Paint. We all know it’s a simple way to add color to your room. Why not try some of these neat ideas. Also, here are a few tips on choosing paint colors. 12. Metal Accents. When shopping for new furniture, look for furniture with metal accents which add interest without adding a new color to your scheme. I feel like everyone loves the idea of neutral decor, but it tends to cause overthinking. “This beige doesn’t match this beige and this is the wrong shade of off white.” Sound familiar? Do yourself a favor, don’t overthink it. The key is balance. Having a good amount of neutral color variations in different textures will balance a room. Trying to match each shade of white/beige/gray won’t look natural and it may drive you crazy. Here are a few examples to give you an idea of what I mean by balance. The above room pulls off neutrals beautifully. The sofas, pillows, rug and wall color are all different shades of creamy white/beige, but because they’re all different textures, they flow well together. Strategically placed items in the same color family but darker (baskets, pots, blanket) pull the room together and give it dimension. 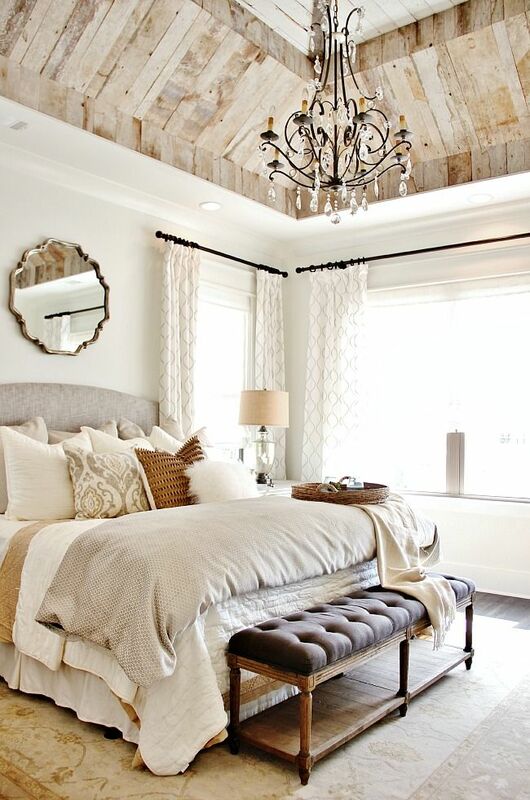 Above is another example of various shades of neutrals used together. Here, not only do the textures vary but patterns vary as well. Again, balance is key. Be sure to use large and small patterns together. Too many large patterns can appear bold; too many small patterns appears to be busy. Once again, a wonderful example of mixing patterns and textures. 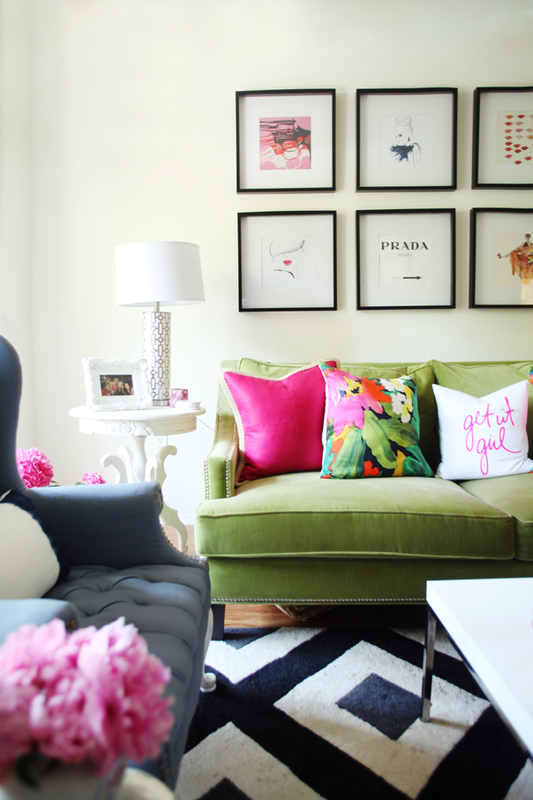 I also love the subtle pop of color with pillows and flowers. Struggling with paint colors? Check out my post here. Monday morning vibes. Trying to get motivated to get moving after a long weekend out of town. Is it just me or does anyone else need a week to recover from just a few days of traveling? Hope your week is off to a great start! The key to a small house is pretty storage. These shelves were diy and I'm pretty sure mason jars never go out of style. Some posts may include affiliate links, but opinions are always my own. All photos are either property of Interiors by Kelley Lively or credited accordingly. Photos may be reposted, but please link to the original source and give proper credit.